Known for its civically engaged staff and students, the Central District high school is one of nearly 30 schools across the district that will lose staff because of lower enrollment, according to a letter sent to principals by district leadership last week. Teachers at Garfield High School briefly halted classes Friday morning after hearing they would lose two colleagues in the district’s recent round of staffing adjustments. At 10:15, teachers ushered their students out of the school’s main building and toward the gymnasium, where many would spend the remainder of the day, listening to speeches from staff. An alert on the district’s website said the sit-in ended before lunchtime, and that the teachers’ actions violated their union’s no-strike clause. 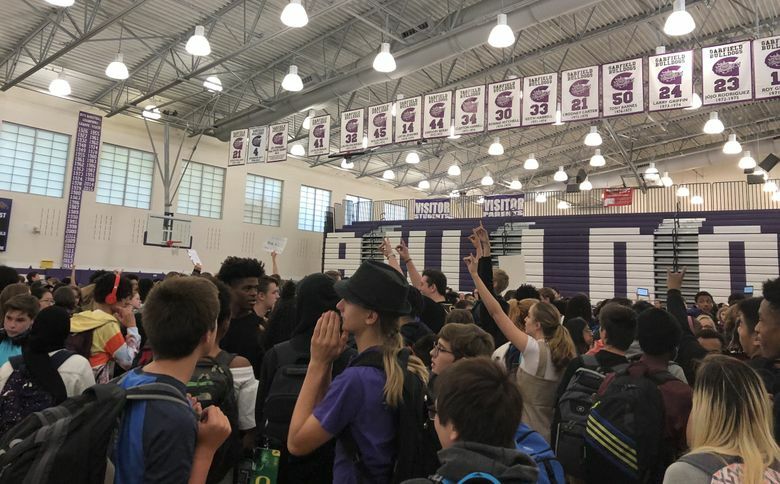 Known for its civically engaged staff and students, the Central District high school is one of nearly 30 schools across the district that will lose staff because of lower enrollment, according to a letter sent to principals by district leadership last week. It’s a reshuffling process Seattle Public Schools goes through most years, but this fall’s adjustments are earlier and more severe than usual, district officials say. The district’s current headcount, 52,258, was more than 700 students below what the district projected for this year — but only 237 students fewer than the number of students enrolled last year. Overall, this gap between how much was projected and the actual enrollment amounts to a $7.5 million shortfall, the district says. Though officials predicted a drop in enrollment this year, their numbers were more out of whack than they were in previous years. A letter sent to principals last week showed Garfield, whose enrollment dropped by 80 students, according to the district, would only lose one teacher. But Thursday evening, teachers said, Garfield staff found out the school would need to cut an additional full-time teacher. The staff members, who teach health and physical education, will be transferred next week, according to four teachers at the school. “There hasn’t been any transparency at all,” said Rosa Powers, who teaches English at Garfield. A quick effort among the staff to organize and respond to the news started late Thursday, said Tim Zimmermann, an English and journalism teacher at the school. Teachers explained the situation to students during first period. Inside the packed gym, students seemed confused but supportive of their teachers. They sat in clusters around staff who held up binders marking where to meet. “It’s kinda chaotic,” said senior student Lisa Rader, 17, who sat on the floor with her friend, Emilia Garcia-Bompadre, also 17, as students walked around them. “But everyone feels bad right now, and wants to stand with the teachers.” She said her teacher began to cry as she explained the staffing displacements. Garfield’s work stoppage marks the second time this week where classes halted in protest of teacher transfers. Earlier this week, students at Nova High School, just a few minutes away, walked out of their school to City Hall to protest two cuts at their school. “In my personal view, this is a race, gender and economic-equity issue,” said Chardonnay Beaver, Garfield’s 17-year-old student body president. Students of color made up the majority of Garfield’s enrollment of 1,600; a third were low-income during the 2017-2018 school year. An information sheet about the sit-in said the cuts would affect schedules for more than 300 students. Earlier this week, JoLynn Berge, assistant superintendent for business and finance, said the decisions took into account the poverty level and demographics of schools, but many questioned the methodology and decision to transfer teachers so early in the school year. The transfers, she said, in combination with a hiring freeze at the district’s central office, are the district’s way of bracing for the impact of a “huge” deficit during the next school year. The transferred teachers will still be paid their wages. Instead of hiring new teachers for vacant positions at over-enrolled schools, teachers already in the district will fill those positions. Ten schools will receive additional staff as a part of the adjustments. Staff reporter Neal Morton contributed to this story.